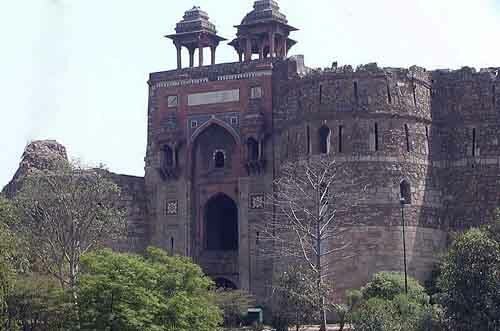 Tourist Place Purana Quila Covering a circuit of about a mile, the walls of the fort have three gates and are surrounded by a mat fed by the river Yamuna. The wall was built by Humayun while the buildings in the fort are attributed to Sher Shar. The notable buildings that have survived in the fort are the Sher Mandal and the Quila-I-kholina Mosque. Sher Mandal is a two storeyed octagonal tower which was used by Humayun as his library. The mosque, built around 1541-42, is a landmark in Indo Islamic architecture. The architect has shown skill by enriching each part with moulding, bracketed openings, marble inlay, carving and other establishments. A variety of materials have also been used to construct the small mosque (168 x 44 feet). The entrance arch is of marble, the spandrels of red sandstone studded with marble bossed, the columns and pilasters of black and white marble. The Purana Qila built on an ancient mound, perhaps conceals the ruins of the city of Indraprastha of Mahabharata story. Archaeologists carried out excavations at the Purana Qila from the 1950's to the 1970's. The excavations showed that the Purana Qila was indeed a very old site. Archaeologists found that the settlement had many phases dating from about the fourth century B.C. (or earlier) to the nineteenth century A.D. Pieces of old pottery known as Painted Grey Ware were also found and this suggested that people may have lived at some spot in or around the Purana Qila from about 1000 B.C. onwards Sher Shah Suri demolished the city of Dinpanah built by Humayun and on the same site raised this citadel. It is believed that Sher Shah left the Purana-Qila unfinished, and Humayun completed it. Among the scribblings in ink that existed in a recess of the gate, there was a mention of Humayun, and it is possible, therefore, that if the gate was not constructed by Humayun, it was at least repaired by him. In the southern gate, which is called the Humayun-Darwaza, there existed a similar inscription in ink mentioning Sher Shah and the date 950 A.H. (1543-44). 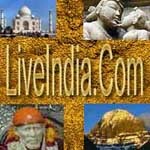 It is believed that this place was Indraprastha the capital city of Pandavas. Many of the present standing monuments were built during the period of Sher Shah Suri. The double-storied octagonal towered mosque is cited in history as the tower from where, Emperor Humayun accidentally fell to his death. The lake at the foothills has boating facilities. One does not have to go far to see the Old Fort or Purana Quila standing stoically amidst wild greenary and disintegrating ramparts. The Purana Quila is roughly rectangular in shape having a circuit of nearly two kilometres. The walls are thick and the three gateways are provided with bastions on either side. The northern gateway called the Talaqui Darwaza or the forbidden gateway combines the typically Islamic pointed arch with Hindu chhattris and brackets. 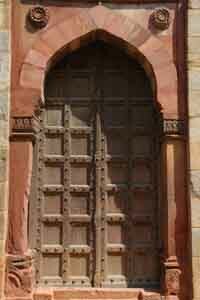 Whereas the southern gateway, called the Humayun Darwaza, had a similar parel with elephants. Humayun who laid the first brick of his new capital Dinapanah in 1534 built the massive gateways and walls of Purana Quila. Sher Shah, who defeated Humayun in 1540, built a few buildings in the complex. Busy traffic runs along this ancient defensive wall built by Sher Shah Suri. The fort, has massive walls and three large gateways. There is a small octagonal red sandstone tower, the Sher Mandal, inside the fort near the South gate. Humayun as a library later used it. While descending the stairs of this tower one day in 1556, he slipped, and received injuries from which he later died. The Qila-i-Kuhran Mosque, or Mosque of Sher Shah, lies just beyond it. There's a small archaeological museum just inside the main gate. There are good views of New Delhi from atop the gate.